Medial epicondylitis or “golfer’s elbow” represents pathologic changes to the forearm muscles attachment to the inside aspect of the elbow. 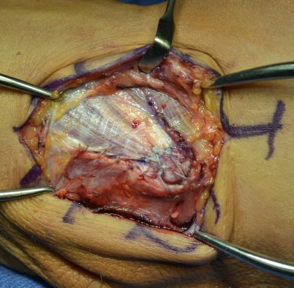 The tendon attachment demonstrates inflammation in its mild form progressing to actual tearing in its sever form. The repetition of forceful muscle contractions contribute to the development of this condition. The incidence of medial epicondylitis is 5 to 20 times less common than medial epicondylitis (tennis elbow) often is not diagnosed accurately. 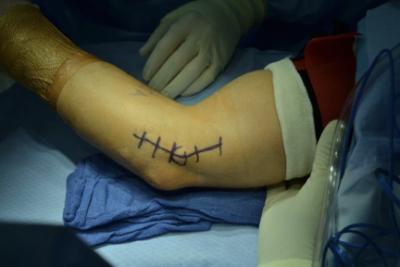 Who is affected by golfer’s elbow? Pain develops on the inside part of the elbow. The pain is worse with gripping activity where the wrist and elbow are extended. The condition is common in golfers, baseball players, weightlifters, and bowlers. Discomfort or pain with holding objects such as a gallon of milk. Dr. Ahmad and his= team meet with each patient to discuss their symptoms and any relevant history. Dr. Ahmad then performs a physical examination, including range of motion and special tests, to further confirm the diagnosis. In some situations, an MRI scan may be ordered to determine the severity of the epicondylitis. MRI aids in determining the severity of the medial epicondylitis. MRI detects tendon tears or signal changes related to tendinopathy. 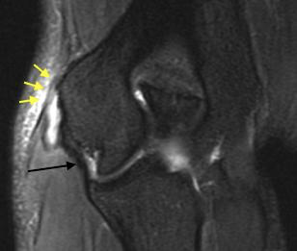 Yellow arrows showing significant tendon tear. Treatment of medial epicondylitis is dependent on a number of factors including duration and severity of symptoms. 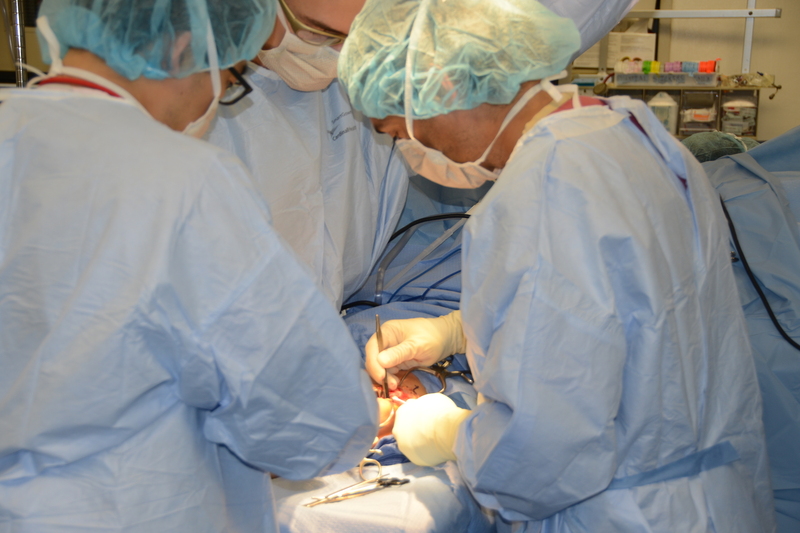 Patients may elect for non-operative or surgical treatment based on evaluation and shared decision making with Dr. Ahmad and his team. Wrist splint for 4 to 6 weeks (varies on severity of epicondylitis). Occasional an elbow brace is used. Avoid gripping activities such as opening a jar or lifting objects greater than 3 pounds. 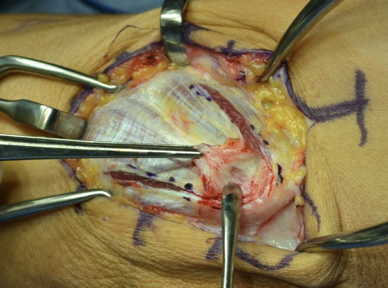 The flexor tendon injury is identified. 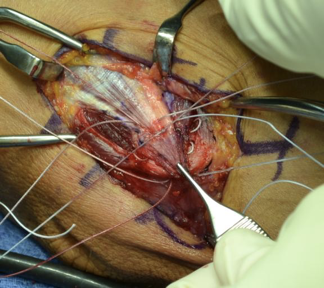 The tendon tear is visualized. 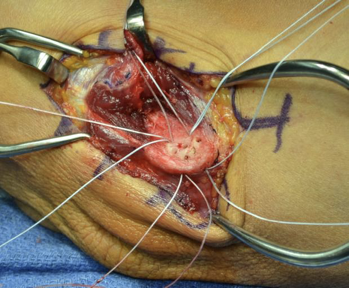 Sutures are used to repair the tendon. 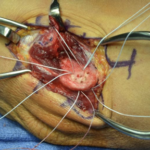 Suture are placed in the tendon. 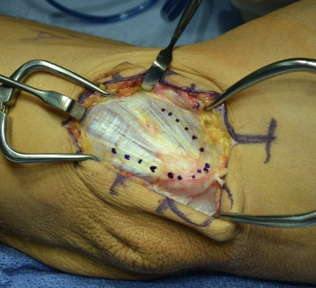 Final repair is anatomic and secure for accelerated rehabilitation.